A huge range of possible activities means it's impossible to get bored here! 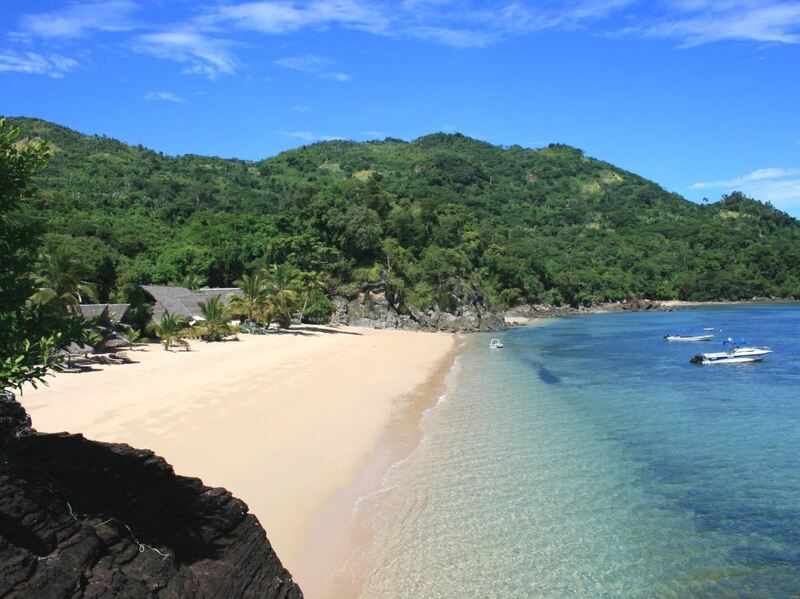 the chance to combine a great beach stay in spectacular surroundings with some of Madagascar’s unique wildlife! 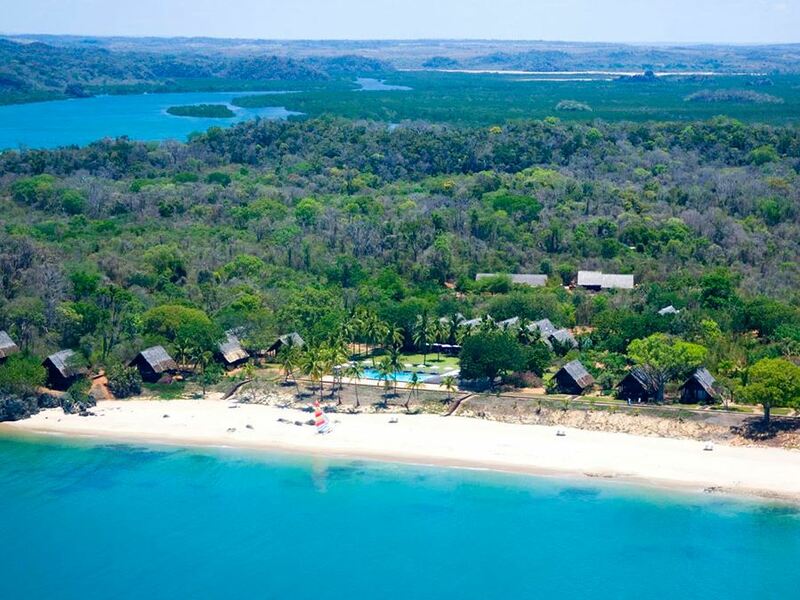 Anjajavy is truly a far flung destination ideally suited to those seeking a peaceful and remote holiday. Pristine beaches, untouched turquoise waters, the unique limestone tsingy and fascinating forests await you. But whilst this is a remote and exceptionally beautiful coast, with sandy coves and azure waters, the big plus point at Anjajavy is that it borders a superb dry forest reserve protecting a plethora of wildlife - Coquerel's sifaka, mouse lemurs, the rare Madagascar fish eagle and chameleons, to name but a few – so you have the chance to combine a great beach stay in spectacular surroundings with some of Madagascar’s unique wildlife! There are 25 air-conditioned two-storey villas at Anjajavy, built of local rosewood and roofed with satrana leaves. Each is extremely comfortably equipped with a large bed, sitting area, breakfast corner, bathroom with oversize bath and shower and separate loo. Upstairs is another room with two single beds and plenty more storage space. 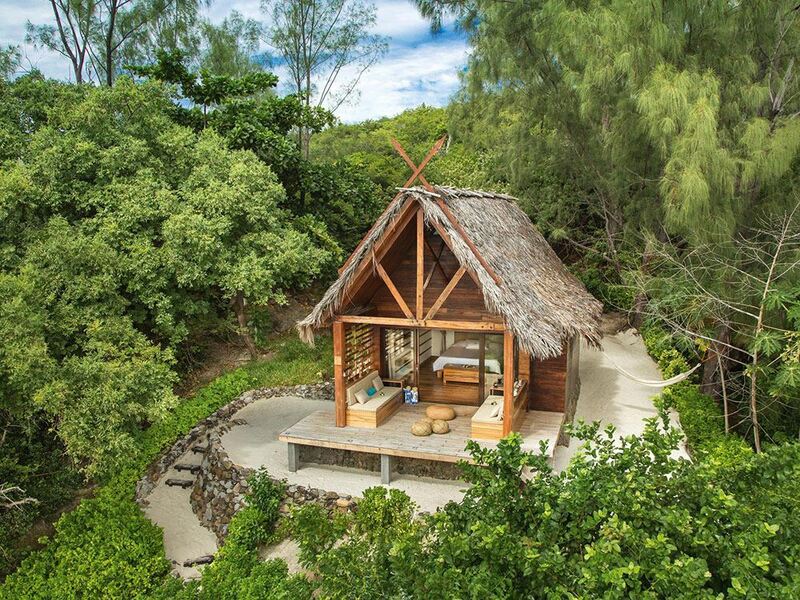 French windows open onto a large sea-facing verandah, furnished with armchairs and a hammock from which you can watch the lemurs in the trees or the fishing pirogues on the ocean. All in all they are probably the most luxurious accommodation to be found in the whole of Madagascar, despite the lodge’s extreme isolation! The main lodge houses a comfortable lounge, the bar and billiards table, the television room and the main restaurant, though many meals are taken outside, on the decked area that runs the length of the main building. The main building looks out across the lawn, usually littered with parakeets, to the huge 200 m2 swimming pool and the Indian Ocean beyond. You can observe the wildlife virtually without effort. 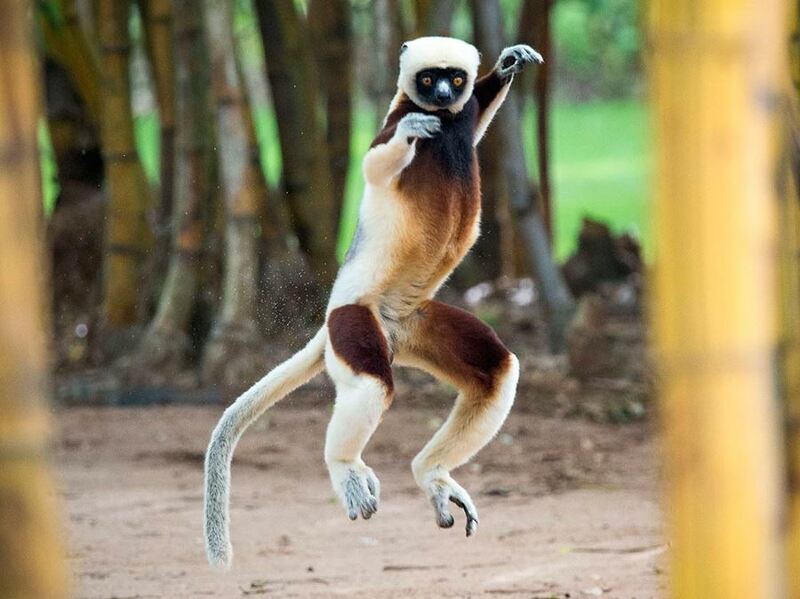 Each day a troop of beautiful Coquerel's sifaka comes to a tree just metres from the beach and Brown lemurs often join them. At night, you can spot mouse lemurs in the beam of your torch. The long, sandy beach in front of the villas is for swimming and relaxation; deck-chairs and shades are provided at discrete intervals. A second beach around the corner is geared towards watersports, which preserves the tranquillity of the villas and the beach in front of them. 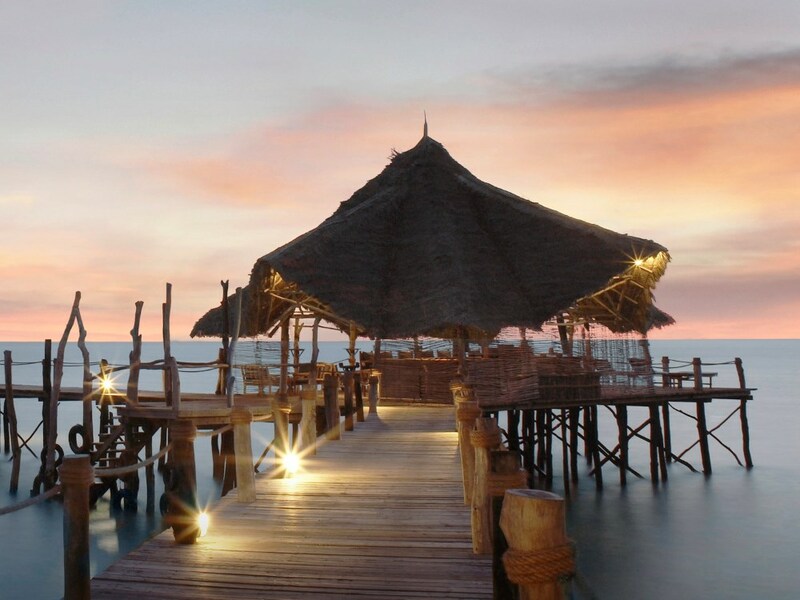 Complimentary watersports include catamarans, windsurfing, canoes, snorkelling and water-skiing. Land-based sports include volleyball, table tennis, badminton, billiards and boules. The fishing is absolutely fantastic here with marlin, sailfish and big tuna the prized targets when going deep sea big game fishing; and fly fishing enthusiasts will also be happy with the chance to catch sailfish on fly! The atmosphere is warm and relaxed at Anjajavy and this is the perfect place to lounge by the pool, explore idyllic beaches and small coves, each one more beautiful than the last, and savour the excellent food, especially the freshly-baked pastries. But it’s the unique wildlife and spectacular natural features that make a visit to Anjajavy absolutely unforgettable!